Fans who have pre-ordered one of the ‘The Big Bad Blues’ + event entry bundles will be able to collect their order from the first floor cash desk along with a wristband for entry on the day of the event. Please bring your confirmation email on the day and a valid form of I.D.. The Q&A will start promptly at 6:00pm please arrive in good time to pick up your pre-order to avoid delays. Pre-orders will be available to pick up from hmv 363 Oxford Street from Friday 21st September at 9:00am. 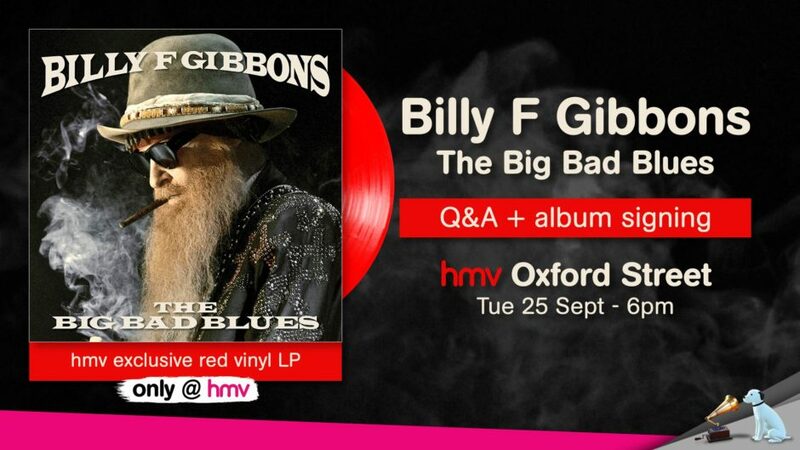 Any pre-orders placed in store or online for any other product(s) by Billy F Gibbons will not qualify for a ticket for this event. Please note that photography restrictions may apply and that Billy F Gibbons will only be signing copies of his new album.